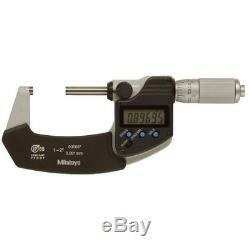 Mitutoyo 293-345 Digital Outside Micrometer, Inch/Metric, Ratchet Thimble, 1-2. The Mitutoyo 293-345 digital micrometer is for taking outside diameter measurements in harsh workshop conditions. The micrometer has a measurement range of 1 to 2" (25.4 to 50.8mm), resolution of 0.00005" (0.001mm), and an accuracy of + or - 0.00005. The LCD screen displays in inches and metric units. The micrometer's plastic components are oil-resistant and measuring faces are carbide-tipped for durability. A ratchet thimble helps provide uniform pressure for precise, repeatable measurements. This gauge is Ingress Protection certified IP65 for protection against dust and water. Functions offered by this model include origin point setting, zero setting, hold, automatic on and off after 20 minutes of idle time, function lock, and an alarm in case of computing error or low-voltage. It has a battery life of approximately 1.2 years of normal use. This unit comes with an SR-44 battery, standard bar for reference, and a fitted, plastic case. LCD displays in both inches and metric units. Flat measuring faces, carbide tipped. 1 to 2 (25.4 to 50.8mm). + or - 0.00005. 158.7mm length and 59.8mm width. Micrometers are precision measuring instruments that use a calibrated screw to measure distances. These measurements are translated into large rotations of the screw that are then able to be read from a scale or a dial. Micrometers are typically used in manufacturing, machining, and mechanical engineering. There are three types of micrometer: outside, inside, and depth. Outside micrometers may also be called micrometer calipers, and are used to measure the length, width, or outside diameter of an object. Inside micrometers are typically used to measure interior diameter, as in a hole. Depth micrometers measure the height, or depth, of any shape that has a step, groove, or slot. Mitutoyo manufactures precision measuring tools, metrology equipment, and related systems. The company, founded in Tokyo in 1934, formed Mitutoyo America Corporation in 1963 with headquarters in Aurora, IL. What's in the Box? Micrometer measures 1.0 to 2.0" (25.4 to 50.8mm) with 0.00005" (0.001mm) resolution and + or - 0.00005 accuracy, for taking outside diameter measurements in harsh workshop conditions - LCD screen displays in inches and metric units - Plastic components are oil-resistant and measuring faces are carbide-tipped for durability - Ratchet thimble to help provide uniform pressure for precise, repeatable measurements - Ingress Protection certified IP65 for protection against dust and water. Even arrived early&###x200B;&###x200B;&###x200B;&###x200B;&###x200B;&###x200B;&##x200B. &###x200B;&###x200B;&###x200B;&###x200B;&###x200B;&###x200B;&##x200B. We do not accept P.
BOXES - PLEASE PROVIDE A PHYSICAL ADDRESS. &###xA0;We advise you to use a reputable carrier service when returning your goods. The item "Mitutoyo 293-345 Digital Outside Micrometer, Inch/Metric, Ratchet Thimble, 1-2" is in sale since Friday, August 3, 2018. This item is in the category "Business & Industrial\CNC, Metalworking & Manufacturing\Metalworking Tools\Metalworking Inspection & Measurement\Micrometers".store" and is located in US. This item can be shipped to United States, Canada, United Kingdom, China, Mexico, Germany, Japan, France, Australia, Denmark, Romania, Slovakia, Bulgaria, Czech republic, Finland, Hungary, Latvia, Lithuania, Malta, Estonia, Greece, Portugal, Cyprus, Slovenia, Sweden, South Korea, Indonesia, Taiwan, South africa, Thailand, Belgium, Hong Kong, Ireland, Netherlands, Poland, Spain, Italy, Austria, Bahamas, New Zealand, Philippines, Singapore, Switzerland, Norway, Ukraine, Croatia, Malaysia, Chile, Colombia, Costa rica, Panama, Trinidad and tobago, Guatemala, Honduras, Jamaica, Viet nam.